No specific antivirals are currently available for two emerging infectious diseases, Middle East respiratory syndrome (MERS) and severe acute respiratory syndrome (SARS). A literature search was performed covering pathogenesis, clinical features and therapeutics, clinically developed drugs for repurposing and novel drug targets. This review presents current knowledge on the epidemiology, pathogenesis and clinical features of the SARS and MERS coronaviruses. The rationale for and outcomes with treatments used for SARS and MERS is discussed. The main focus of the review is on drug development and the potential that drugs approved for other indications provide for repurposing. The drugs we discuss belong to a wide range of different drug classes, such as cancer therapeutics, antipsychotics, and antimalarials. In addition to their activity against MERS and SARS coronaviruses, many of these approved drugs have broad-spectrum potential and have already been in clinical use for treating other viral infections. A wealth of knowledge is available for these drugs. However, the information in this review is not meant to guide clinical decisions, and any therapeutic described here should only be used in context of a clinical trial. Potential targets for novel antivirals and antibodies are discussed as well as lessons learned from treatment development for other RNA viruses. The article concludes with a discussion of the gaps in our knowledge and areas for future research on emerging coronaviruses. The authors thank Laura Bollinger and Jiro Wada for providing technical writing services and graphical support, respectively. The content of this publication does not necessarily reflect the views or policies of the US Department of Health and Human Services (DHHS) or of the institutions and companies affiliated with the authors. This work was supported in part by the Division of Intramural Research and Division of Clinical Research, National Institute of Allergy and Infectious Diseases. This work was funded in part through Battelle Memorial Institute’s prime contract with the US National Institute of Allergy and Infectious Diseases (NIAID) under Contract No. HHSN272200700016I. J.D. performed this work as employee of Tunnell Government Services, Inc., subcontractor to Battelle Memorial Institute (BMI). R.G. performed this work as employee of BMI. G.G.O. performed this work as employee of MRI Global, subcontractor to BMI. World Health Organization. Middle East respiratory syndrome coronavirus (MERS-CoV)—Saudi Arabia. Disease outbreak news. 2017. http://www.who.int/csr/don/17-january-2017-mers-saudi-arabia/en/. Accessed 24 Jan 2017. King Abdullah International Medical Research Center. MERS-CoV infection treated with a combination of lopinavir /ritonavir and interferon beta-1b (MIRACLE). Bethesda: National Institutes of Health; 2017. https://clinicaltrials.gov/ct2/show/NCT02845843. Accessed 12 July 2017. World Health Organization. Categorization and prioritization of drugs for consideration for testing or use in patients infected with Ebola. 2015. http://www.who.int/medicines/ebola-treatment/2015_0703TablesofEbolaDrugs.pdf?ua=1. Accessed 13 Oct 2016. Paladin Therapeutics. Impavido (Miltefosine) capsules, for oral use prescribing information. Wilmington: Paladin Therapeutics; 2014. https://dailymed.nlm.nih.gov/dailymed/fda/fdaDrugXsl.cfm?setid=d6658aeb-7bc1-4eef-ad0d-0a873ddbecf5&type=display. Accessed 13 July 2017. AIDSinfo. HIV treatment. FDA-approved HIV medicines. 2016. https://aidsinfo.nih.gov/education-materials/fact-sheets/21/58/fda-approved-hiv-medicines. Accessed 13 Oct 2016. World Health Organization. 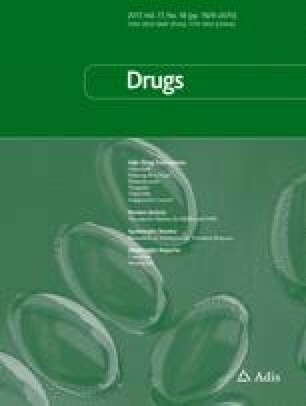 Consolidated guidelines for the use of antiretroviral drugs for treating and preventing HIV infection. Recommendations for a public health approach, 2nd edn. 2016. http://www.who.int/hiv/pub/arv/arv-2016/en/. Accessed 13 Oct 2016.